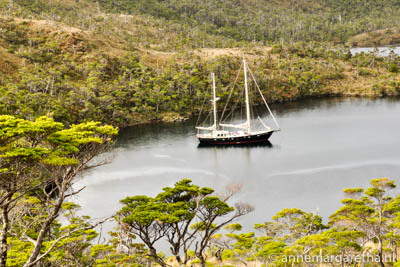 In the middle of the Southern Ocean there is a great wildlife paradise: South Georgia. The archipelago is well known for the large numbers of sea birds and seals that are breeding here. 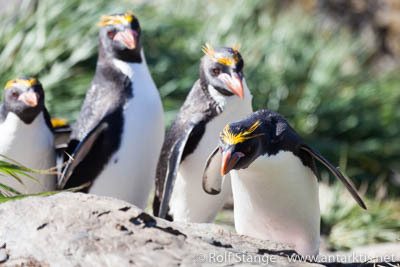 The land is home for four species of penguins: King penguins, Gentoo penguins, Chinstrap penguins and Macaroni penguins. Bird Island is part of South Georgia. This little island lays northwest of the main island. British scientists have been operating a biological research station here for the last decades. This year the researchers published all their knowledge of the last 22 years on the diet and the population development of Gentoo penguins and Macaroni penguins. The scientists found a trend in a well doing Gentoo population versus a less well doing Macaroni population. They describe the Gentoo as a generalist species, feeding in the pelagic zone as well as at the sea bottom close to the coast. The Macaroni is described as a specialist species feeding all kind of crustaceans close to the shelf-break region. However, the most important and energy rich main food of both penguin species is the Antarctic krill (Euphausia superba). But while the Macaroni penguin sticks to crustaceans, the Gentoo is preferring various fish species especially during the breeding season. One important source is the commercially used Mackerel icefish (Champsocephalus gunnari) . Life is not distributed evenly in the oceans. Water masses are complex and water fronts are of high importance. An important convergence zone is situated North of South Georgia. Here a layer of cold, oxygen-rich surface water from the South meets warm, oxygen-poor surface water from the North and sinks underneath it, before the cold water continues its way northward as intermediate water layer. Such zones can be found anywhere in the world. Here, the water masses mix. They create a corridor full of life where tiny crustaceans feed on algae and are eaten by other species like fish or sea birds. This zone is so important for the southern marine ecosystem, because it is not interrupted by any land masses. It also defines the northern boundaries of the Southern Ocean. Depending on the prevailing winds, winter sea ice distribution or the amount of large icebergs in the area, this rich mixing zone moves further to the North or to the South. Interestingly, the richest Sub-Antarctic Islands are situated within this productive belt. Penguins swim different distances to find their food. The energy intake has to be balanced. The food of a foraging bout must cover both the energy consumption during the hunting trip as well as the time the bird spends on shore. During the breeding season the food for the offspring has to be accounted for as well. If the balance is correct, the population is doing well. If the prey changes its whereabout due to changes in its habitat (water temperature, salinity, commercial fishing), the penguins have to swim further to reach their prey or they will switch to alternative prey, with less energy outcome. The energy brought along may not be sufficient enough for the offspring to survive. Both discussed species differ clearly in their way looking for food. The Gentoo penguins with their two chicks are often staying close to the coast. They usually return to the nest after one day foraging. The Macaroni penguins use to swim about 150 kilometers for several days to catch enough food for themselves and their single chicks. Both species have the same prey species on the menu. But if they breed together, like on Bird Island, then the Gentoo prefer various kind of fish near the coast and the Macaroni catch different crustaceans on the shelf edge. The scientists of the study would now like to understand, how changes in the diet composition of the penguins reflect changes in the marine ecosystem. Krill and fish stocks are playing a major role in this food web, since both are resources for the animal predators and the fishing industry.